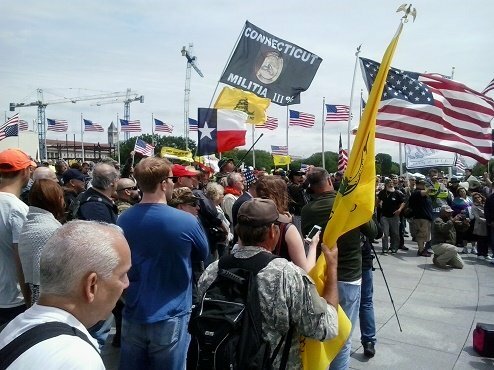 Remember Operation American Spring? 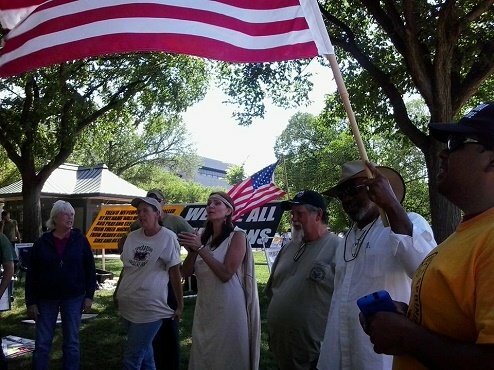 Back in May a couple hundred of them arrived in Washington, vowing to maintain a daily protest until Barack Obama, Joe Biden, Mitch McConnell, John Boehner, Harry Reid, and Nancy Pelosi were forced to abandon their offices. They were mighty, even if they didn't quite make the 10 million to 30 million attendance mark they'd predicted. But they did at least get Obama to resign, didn't they? Oh, and Eric Holder. 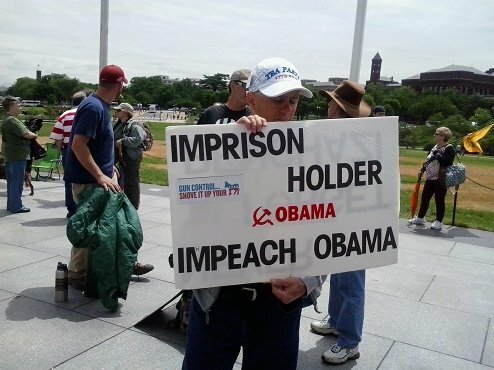 Better arrest Holder, just to be sure he can't sneak back in. Fast and Furious! ObamaCare! BENGHAZI!!! It was going pretty well for a couple of days. They prayed in front of the Lincoln Memorial, they flew their flags by the Washington Monument, they yelled their demands at the White House. They settled into a shady spot by a snack shack on the National Mall within view of the Capitol and Camp Liberty was born. 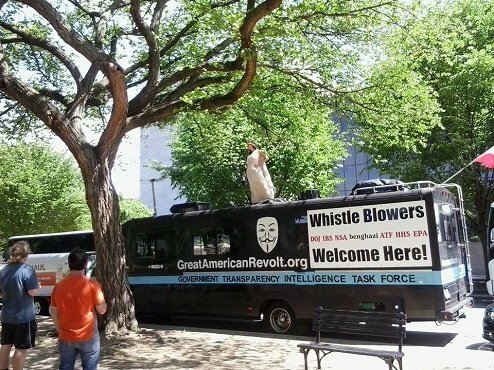 And parked at the edge of their patch of grass was a black RV covered in Anonymous and WikiLeaks logos with an OCCUPY flag flying from the back. The first time we noticed it there was a woman in a flowing tunic standing between the skylights, blowing a duck call. Meet Christine, God-Appointed Sheriff of Washington, DC. 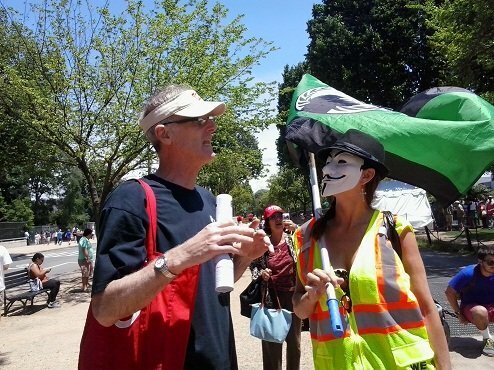 Christine came for Operation American Spring because she wants to overthrow the federal government, but some of her other causes didn't line up too well with the majority of OAS protesters. She's a vocal supporter of Chelsea Manning, Julian Assange, and Edward Snowden, she thinks Osama bin Laden's assassination was a hoax, and she has a large web presence dedicated to the theory that the 9/11 attacks were orchestrated by the George W. Bush administration. 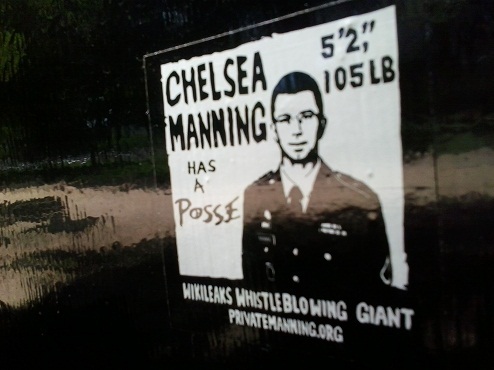 To keep the peace, she tried covering the WikiLeaks logos on one side of the bus, which she calls the Anonomobile. 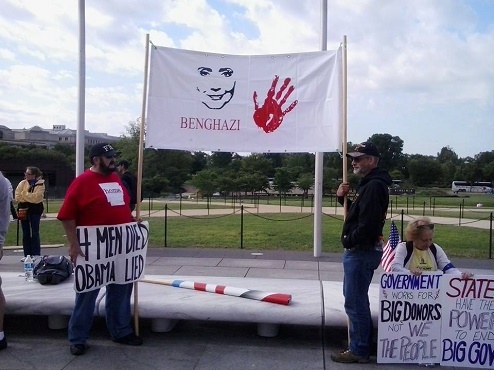 Then her fellow protesters asked her to stop telling passers-by that a passenger jet couldn't have made a hole that small in the Pentagon and that the damage to the building was inflicted by a missile. Christian fellowship seemed to keep things calm for awhile, but after about a month, Camp Liberty was down to a few dozen diehards and Christine's small faction felt increasingly unwelcome. A shoving match between the Anonomobile's resident A/V expert Media Matt and OAS pastor Sylvester Bland (seen above, with flag) brought out the Park Police, and Christine began to suspect that the people who'd taken charge of the "leaderless movement" were either secretly government contractors or only interested in skimming donations coming in through the project's various web pages. 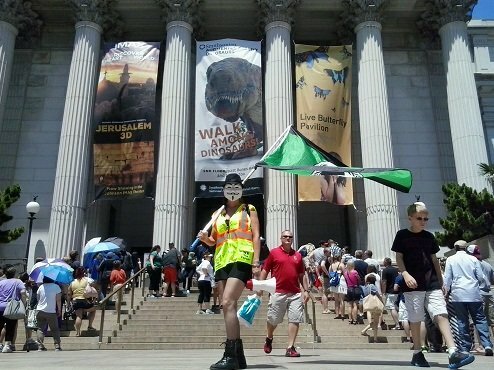 She was determined to protest in favor of government transparency in view of the Capitol and the throngs of tourists passing by on the National Mall, but the ideological and personal disputes with OAS boiled over and even a shared commitment to taking down Barack Obama could not bridge the gap. 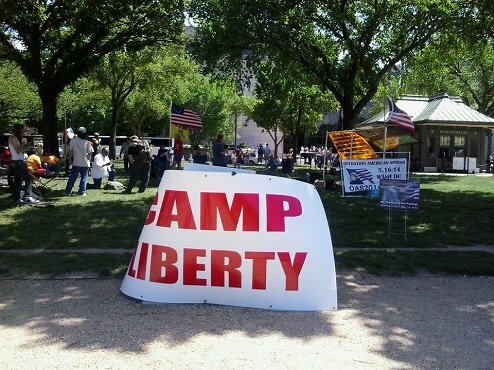 She moved the Anonomobile closer to the Capitol as the population of Camp Liberty dwindled to zero and its spiritual father, Col. Riley, declared that the protest had "made a difference" and that he was resigning as its leader. Obama remains in the White House, so Christine and Media Matt remain on the Mall. They spend their time engaging the public, tweeting, posting frequent public Facebook updates, and filling her YouTube channel with videos about the importance of net neutrality, how hard it is to walk into the Department of Justice for no reason, the aftermath of the "Kenyan Occupation" (also known as the Smithsonian Folklife Festival), and the utterly prejudicial ticketing habits of the Park Police. Since Anonymous avoids naming leaders or spokespeople, it doesn't exactly have a VP in charge of franchising. 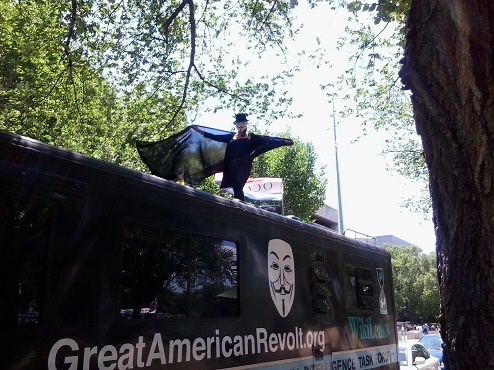 If you want to paint your RV with Anonymous symbols, name it the Anonomobile, and drive it to protests to promote Anonymous, no one's going to stop you, but some of the Anonokids might not be too happy about it. They might be mad enough to fire up the ol' text-to-voice and take to YouTube to say you are almost definitely probably an FBI informant. Probably. Is Christine a covert agent? We cannot say! We do not have these Friends with Access to Information. She has always been quite cordial to us, and the closest she comes to a disguise is doubling up on her hippie accessories to appear harmless to the police protecting the government she's vowed to dismantle. Well, you could say she's kind of in disguise when she puts on the mask. It's hard to call her covert, especially when she uses the bullhorn to remind the complacent public that "HACKTIVISM IS SELF-DEFENSE." 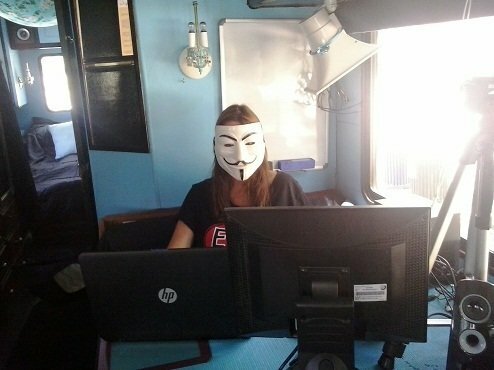 Christine says she's staying in DC until November, waiting not for the midterm elections but for the Anonymous Million Mask March, commemorating the plot to attack Parliament on November 5, 1605. 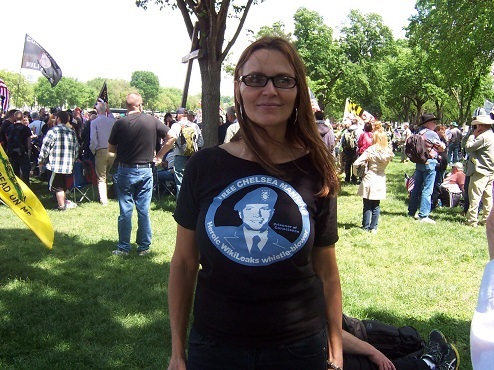 Her call for revolution continues 71 days after Operation American Spring first arrived, and she can almost always be found with her Anonomobile and Media Matt parked on the National Mall between 3rd and 7th Streets, NW. Chances are she'll offer you a drink of water and invite you inside to sit for awhile in her soothing blue oasis to escape the disgusting heat of the DC summer. She's nice like that. Just don't be offended if she's got some stuff to do. Beth will be live-tweeting the revolution from the food court of the Air & Space Museum.